I recently saw an internet meme that said, “...if you ever want to know what a teacher’s mind feels like, imagine a web browser with 2,879 tabs open. All. The. Time.” Though I couldn’t agree more, I don’t feel like this is unique to teachers. Living in the age of information demands that we are focused on more than one thing at all time. Who ever has only one tab open? No one. In fact, most of those pictures that show a highly productive millennial sitting and working in a coffee shop include at least two devices. A study done by the Nielsen Company and reported by CNN showed that American adults spend more than 10 hours per day consuming media on a screen. I’m sure most of the readers of this blog are aware of the benefits of limiting screen time among children, but if you were to come into my 6th grade classroom, you would see children on screens at some point in the class, nearly every day. A one-to-one Chromebook policy in schools is so powerful. My classroom is nearly paperless, a real check in the box when it comes to greening a classroom. Technology is a powerful and necessary tool in education. 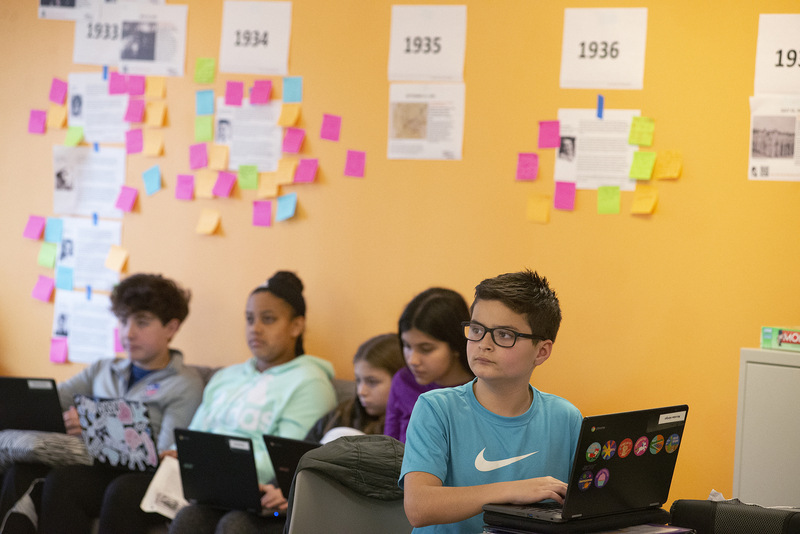 With the growing demand for workers will skill sets in data analytics, cyber security, and computer programing, we have to assume many of our current Lowell School students will one day work in the tech field. So, we simply can’t turn off our screens and go hang out in the woods all the time, though I would like to. At this point, the numbers shouldn’t be surprising. This is not an article to make you feel badly about too much screen time or the possible negative effects of screen time on a child’s health. However, it is about playing the balancing act. If we are aware that our screen time is increasing, that our exposure to new technology and electronic media is not going to stop, and that computers have practically replaced the textbook (you know, those tomes that had the names of the students who used the book for the past 10 years written on the inside cover), then we can start to balance it out with a focus on an intentional time commitment to the natural world. Just the other day I had a quiet and shy young student show a spark of excitement and pride at his ability to identify a woodpecker in Rock Creek Park. When I asked how he knew that the sound he was hearing was a woodpecker, he said, “I remember hearing it with my Dad.” In this class, students had a clipboard with a few different birds to identify and check off once they spotted them in the woods. After our friend shared his identification based off of sound, we looked up in a tree and spotted another woodpecker by sight. Students quickly looked at their ID guide, confirmed that it was a woodpecker, and then watched as the bird pecked away up and down the tree. I could tell that this experience left our typically quiet friend feeling pretty good about himself. I highlight this story in order to provide a glimpse at how important outdoor education can be for young children. This particular student was given an opportunity to shine in a unique environment. His peers were able to see him in a positive light, and the child was able to connect his family experiences to what was being studied in science. When you read about effects of outdoor education on young children’s self-esteem, this is what it can look like. Although children as young as Kindergarten and 1st grade may not have 10 tabs open on their personal computers or the burden of vibrating cell phones in their pockets, they do have to digest a lot of information all the time. Getting out in nature and focusing on something simple, such as spotting or hearing a few birds, can be a great way to sort through or take a break from that onslaught of info. 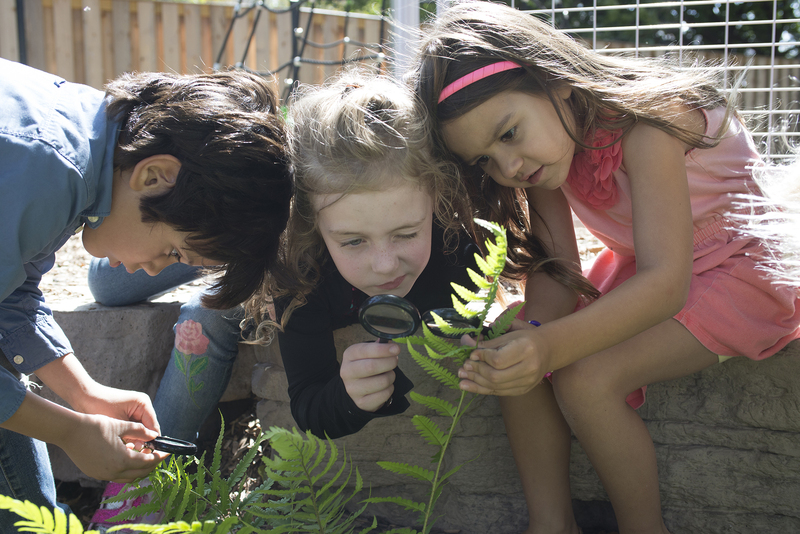 Kindergarten and 1st grade outdoor science classes at Lowell last only 45 minutes, once per week. But, I have seen in those 45 minutes how the opportunity to get some energy out, to focus on something other than a screen or writing or drawing, to get muddy or wet or hot or cold, to listen, feel, see, and hear, can put a little more weight on the side of nature and balance out the technology use that’s become so much a part of our lives. Don’t just take my word for it. Investigate a little further! There is a growing field of literature on the benefits and importance of outdoor education in the digital age. One of the great leaders in outdoor education and nature-based experiences for children, Richard Louv, uses his organization to provide excellent articles, resources and tools. That feeling of having too many tabs open at one time is real. But, it can be wiped clean and cleared out with a short walk down a nature trail. Take a look at this site, then close your device and take a walk through the woods to see if you agree with what it’s saying. This website will help you understand the benefits of outdoor play and nature experiences as they relate to the whole family. Can being outside help alleviate the symptoms of anxiety, low confidence, ADHD, and slow processing speeds? Read this article to find out more.